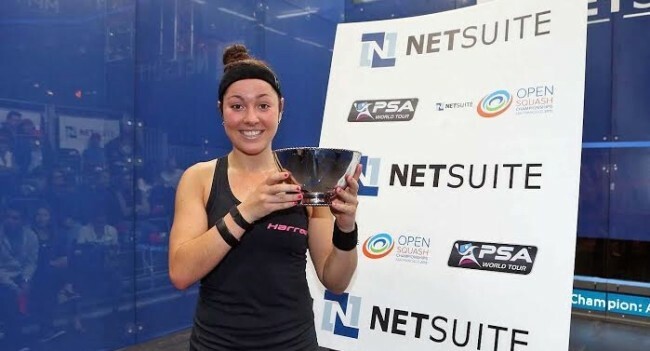 American number one Amanda Sobhy delighted a capacity crowd in San Francisco earlier today when she defeated England’s Sarah-Jane Perry to claim the 2015 NetSuite Open, PSA W25 title. Sobhy stormed her way through the draw to reach the final, dropping just one game en route, to line up against second seeded Perry, who had triumphed in their only previous meeting on the PSA World Tour – but in what proved to be a compelling title-decider it was the World No.19 who took the spoils to rapturous applause. Sobhy started strongly, applying her trademark attacking style, to take the opening game before Perry responded to level the scores at one game apiece. However 22-year-old Sobhy again reasserted her status as one of the sport’s most promising talents when she dictated the pace in the third and despite watching two match balls go to waste, she regrouped to take the fourth game and the championship at the third attempt, prevailing 11-5, 4-11, 11-5, 12-10. “I’m feeling great right now and I’m just really happy to get the win here tonight,” said Sobhy after winning (right). “It was a big goal of mine to come here and perform well, especially leading up to the US Open – I’m playing SJ again there in the first round and I know she’ll come back stronger. 2015 NetSuite Open W25, San Francisco, USA.